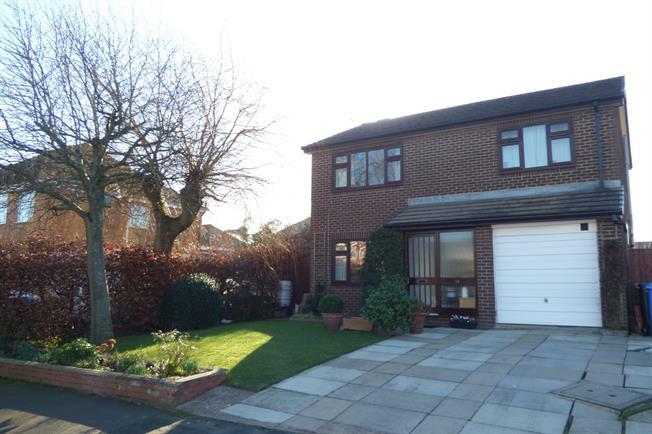 4 Bedroom Detached House For Sale in Warrington for Asking Price £275,000. Audre Close is a beautifully laid out cul-de-sac and it is evident the neighbours are all proud to live there due the wonderful presentation of all homes and there gardens, and this property is no exception. This four bedroom detached home will impress most buyers and enjoys a south facing rear garden which has been carefully landscaped and maintained and is a credit to the owner. The living accommodation has been modified from its original design and now offers a wonderful through lounge measuring over 23 foot in length and enjoying a dual aspect with plenty of natural light. A fantastic fitted kitchen has a real farmhouse feel to it and makes a wonderful family room and would make an ideal room for entertaining. All ground floor rooms are accessed via a spacious entrance hallway which includes a cloakroom/WC and with stair access to the upper floor. The first floor enjoys four well presented bedrooms of which three are double and a great single bedroom, and again the bathroom has been re-designed and offers a fabulous modern fitted suite. The property offers plenty off-road parking by way of the double width driveway and with access to the integral garage which could be converted into additional reception space. We would genuinely urge early viewings to avoid missing out.